One of the amazing circus stunts featured in Frank Capra’s Rain or Shine (1930), based on the Broadway play. Kim Novak outside the dream house being designed by architect Kirk Douglas in Strangers When We Meet (1960). Think of the teeming hub of humanity that is New York City and then imagine a person with a highly contagious and deadly disease wandering among the masses, spreading death and panic. Based on an actual case in 1946 – a smallpox scare in which millions of New Yorkers received free vaccinations – The Killer That Stalked New York (1950) is a fictionalized dramatization of that incident. It stars Evelyn Keyes as Sheila Bennet, a modern day “Typhoid Mary” who contracts smallpox in Cuba while serving as a courier for Matt (Charles Korvin), her no-good musician boyfriend, in a stolen diamond smuggling scheme. 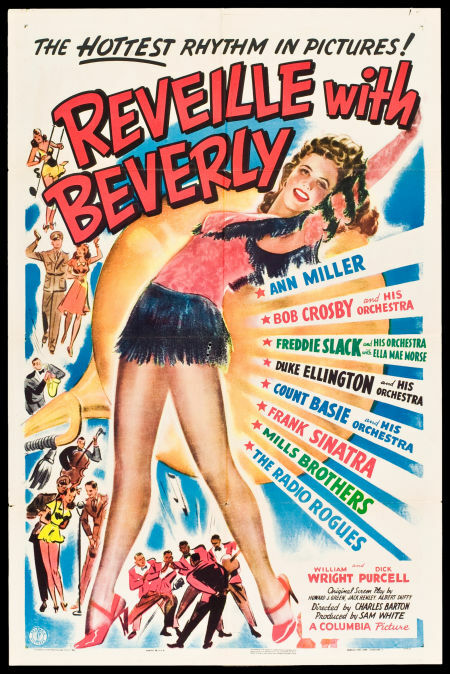 When Reveille with Beverly was first released in 1943, it was viewed as little more than a snappy little B musical programmer that showcased a star on the rise (Ann Miller) along with some of the top musical acts of the day. It was also a reflection of the type of assembly line escapist fare being released by Hollywood for war weary audiences and servicemen who needed a distraction from the harsh realities of a global conflict.